Gutters & Downspouts are an important part of your home’s weatherproofing system. However, for many homeowners, their gutter system is a secondary concern and often gets neglected… Don’t make that mistake! Our standard cleaning service is designed to ensure that you not only have proper drainage but also helps deter critters from setting up home in your gutters and downspouts. The cleaning of roofs, rain gutters and downspouts is a critical part of prudent, annual home maintenance. Our services allow the entire gutter system to function and achieve its maximum life expectancy. The Precision team makes sure all loose debris is removed from both flat and sloped roof areas, that all rain gutters are cleared by hand and rinsed clean with water, and that each downspout is flushed thoroughly and checked from ground level to ensure proper flow. The gutters, siding and grounds are left spotlessly clean and the debris is hauled from the site or disposed of as stated in our proposal. Our Guarantee for Clean Gutters... We guarantee that all rain gutters will operate and drain properly for the first storm after service. If any clogging or overflow is observed during that first rain, give us a call and a technician will return to the job site free of charge to correct the problem. Protect your gutters from ever clogging again-Guaranteed! Clogged gutters can cause water damage to your home. Install LeafDefier and help protect your home from foundation problems, basement leaks, rotting windows, rotting fascia boards and soffits, mold, mildew, and insect infestation. The sleek and streamlined design is virtually invisible once installed and will not interfere with the beauty of your home. 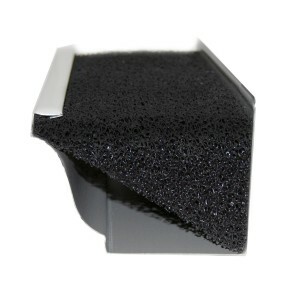 LeafDefier ® is an open cell polyurethane insert, specially shaped and cut to fit snugly into your gutter. 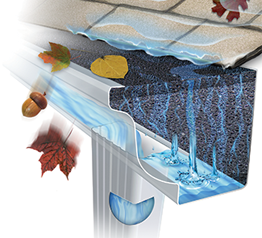 Even during the heaviest of rainstorms, water flows through the LeafDefier ®, into the gutter valley and out the downspout. Leaves and debris normally slide off the surface or just dry up and blow away. 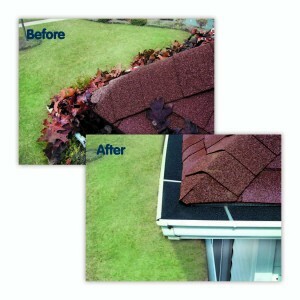 It is very low maintenance and may only need some small debris removed from the top periodically. This product has been successfully installed in thousands of homes across the nation, protecting them from all types of extreme weather conditions. It withstands heat and torrential rains. LeafDefier’s ® material is factory treated with a Biocide and Fungicide that inhibits the growth of mold, mildew, fungus, algae and moss. It is top coated with a UV stabilizer to prevent degradation from the sun as well as having a fire retardant coating.